Halloween is only a few months away. Forget Freddy, Jason, [Michael] Meyers [sic], here's your chance to scare the *#&% out of everyone and win every costume contest with this amazing Tot Mom latex rubber mask, possibly the most frightening mask on the planet. And I can almost guarantee it's the 'only' Casey mask on the planet. Sculpted to precision for a parody video, … only 9 of these film props were made for production…. This one is in excellent condition and it is numbered 6 of 9. I kept one for myself because I know these will be priceless. A significant piece of crime history. No matter what your opinion of the trial is, this is still one heck of a conversation piece. I bet Nancy Grace would love one of these. Fits most head sizes comfortably. Let's never forget poor Caylee. Production used prop, item sold as is. … Good luck. Oh, nice shout-out to the victim there at the end. 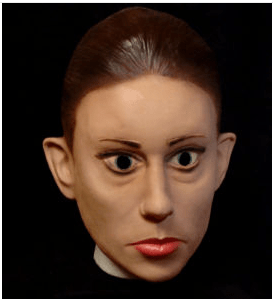 Although I guess it's true that wearing this latex mask of her alleged murderer's face would ensure that you and your loved ones and the many people trying to kill you on sight would all be unlikely to forget poor Caylee. At the time of this post, the current bid was $24,500, but you can do better than that. The bidding ends at 6 pm Pacific time. Updated (~4:30 pm Pacific): Well, the bidding is up to $999,900, and at this point I'm starting to think that people aren't taking this seriously (but maybe Nancy Grace is desperate to have it). Just over 90 minutes left on this auction. Ah, La Stupidité, Elle Brûle! Poll: What’s the Scariest Part of the Torture Memo?